Eric Blair, or George Orwell as he would later come to be known as, spent most of his childhood in India. In early adulthood, he would serve on the Indian Imperial Police Force in Burma. Orwell used his impoverished upbringing to pen an autobiography (Down and Out in Paris and London) as well as his time in Burma (Burmese Days) and the Spanish Civil War (Homage to Catalonia) and lastly the struggles of England’s unemployed coal miners (The Road to Wigan Pier) to draw attention to mankind’s nature to systematically oppress one another through politics, economics and physical capability. Orwell was deeply opposed to totalitarianism – as is evident in one of his most prominent novels, Animal Farm. Orwell succumbed to a fatal lung condition at the age of 47. Animal Farm inspired several other works, including the movie appropriately titled: Animal Farm. The cleverness of the swine, the tremendous strength of Boxer, the horse, and the complete absence of mankind allows Animal Farm to flourish. The animals adorn the side of the barn with the Seven Commandments of Animalism and agree to abide by these rules at all time. They declare that every animal is create equal and must not ever act in a way that a human would, this incudes not sleeping in a bed, killing their fellow animal, walking on two legs, consuming alcohol, etc. Lusting for power, Snowball and Napoleon soon become embattled in a struggle for leadership; a rivalry that spawns from Snowball’s suggestion to construct a windmill. After the final discussion, Napoleon enlists the aid of dogs, which he has secretly groomed to serve him, to turn on Snowball and chase him away from Animal Farm. With Snowball gone, Napoleon has no trouble convincing the others that he was a negative influence on them and strips them of their right to vote. He insists that he will assume the ‘burden’ of leadership and is aided by Squealer, an oaf of a pig who convinces the others that Napoleon acts in their best interest. Over the course of the next few years, the inhabitants of Animal Farm compete against their human neighbors. The windmill, unable to stand up to a storm and an attack by the humans, eventually falls. Unable to accept culpability, Napoleon blames everything on Snowball, the traitor, and deploys fear tactics and even deadly force an all of those who might question him. Behind the scenes, the pigs rewrite each of the commandments in order to substantiate their deceitfulness. They start to ration less food for the other animals and insist that the animals must work harder and longer while they in turn work less. The rest of the farm animals, misled by the stories concocted by the pigs, believe that they are part of a great revolution. However, when Boxer, the most steadfast worker on the farm, grows old and tired and is no longer able to work, he is sent by the pigs to a glue factory and the money made is used to buy whiskey. More years go by, and the original members of the animal revolution begin to pass. The ones that remain have difficulty remembering the original philosophies and objectives. The pigs have learned how to walk on their hind legs and have resorted to carrying whips. The Commandments have been altered to state, “All animals are equal. But some animals are more equal than others.” The pigs have called a truce with their human counterparts and feast together. The rest of the animals gaze on in disbelief; they are no longer able to differentiate the humans from the pigs. 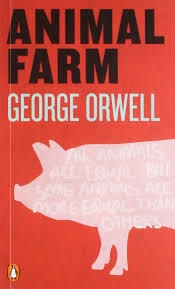 Orwell has been quoted as saying, “Every line of serious work that I have written since 1936 has been against totalitarianism.” A statement that is evident in Animal Farm. Totalitarianism refers to a state of government that seeks out ultimate control over every aspect of life – from thoughts, beliefs, ideas and even politics and economics. Every totalitarian state endeavors to justify their governance. For example, Jones operates Manor Farm on the pretence that humans are superior to animals, while Napoleon operates Animal Farm claiming to fight for the rights of animals against unscrupulous humans. Animal Farm paints a clear picture of a revolution. In his dying declaration, Old Major offers the animals a new viewpoint of their life under the rule of Jones. This causes the animals to envision a better way of life, free from the perils of exploitation at the hands of the humans. The revolution depicted in Animal Farm, like all revolutions, is formed out of a joint desire for a better life. Initially, the pigs are excited about the concept of animal equality, however, through their own self-interest, they create the totalitarian state that they pledged to destroy. At its very roots, Animalism states that all animals are equal. However, it isn’t long before Napoleon and his swine start to title themselves as ‘mind workers’ in order to separate themselves from the other animals who are tasked with hard labor. As years progress, the pigs begin to segregate their offspring from those of the others, and establish themselves as the dominant class, while the other animals are merely menial staff. An elder swine, Old Major is the founding father of Animalism. It is through his teachings that the other farm animals decide to revolt. A prize pig, Old Major has lead a life of privilege and has acquired noble status amongst the others. It is this status, and life of leisure, that has allowed him the time necessary to develop a full understanding of the depths of the exploitation that animals experience at the hands of mankind. Old Major’s dying speech inspires the animal revolution. He symbolizes the forefathers of communism, Karl Marx and Vladimir Lenin. A member of the pigs, and a disciple of Old Major. Napoleon is described as a ‘fierce looking Berkshire boar.’ Unlike Snowball, Napoleon craves power. He is shrewd, cowardly, evil and extremely selfish. Despite having completely supported the revolution, Napoleon is much more interested in taking a position of power for himself. It is this thirst for power that causes to construct a totalitarianism government – ripe with terror and lies. A government that is considerably more evil than Mr. Jones ever was. He symbolizes Stalin, leader of the Soviet Union from 1930 to 1953. Another disciple of Old Major. Snowball is said to be much more capable and intelligent than Napoleon, however, is less interest in control. Snowball appreciates the idea of the revolution and what it stands for, however, there are times where he appears to be willing to disobey the concept of animal equality in order to make his own life more comfortable. When all is said and done, Snowball is unable to stand up to Napoleon. Another member of the pigs, Squealer is a born speaker. He puts his own interests well above those of the other animals. Whenever any of the pigs go against the animal commandments, Squealer does his best to convince the other animals that the pigs have the best interest of the animals at heart. Indicative of the working class, Boxer is honorable and strong. However, he is not the smartest animal on the farm. He believes strongly in the revolution and everything it stands for – so much so that he is willing to support Napoleon without question. He is often heard saying ‘Napoleon is always right.” Boxer has the brute force to overthrow Napoleon but chooses to blindly follow him because he is unable to see that they are under a dictatorship. Boxer supports Napoleon with everything that he has in him, yet in the end, Napoleon sends him to a glue factory. The most motherly of the bunch, she is a gentle soul who believes in the revolution. However, she soon begins to question Napoleon’s motives, but never stands up to him. Despite witnessing the totalitarian environment the pigs have created, she fails to understand that anything is wrong. Benjamin is a donkey with a skeptical outlook on life. He believes that life will always be painful and difficult. He is not shocked when the pigs tarnish the revolution and destroy Animal Farm. Even though his skepticism proves true, it also renders him powerless. He understands what is happening yet does nothing to stop it. He feels extreme guilt when Boxer, one of his closest friends, is killed. Read in Chapter III, this is how Snowball paraphrases the Seven Commandments of Animalism, which are designed to support Old Major’s speech on the importance of animal unity in the face of oppression by the humans. This is one example that the author uses to substantiate how elitist, or the upper class, might use language to oppress the lower class. Taken from Chapter V, this quote pertains to Napoleon’s violent exile of Snowball from Animal Farm, it is said to reference the decline in the relationship between Leon Trotsky and Joseph Stalin. Napoleon knows that, of the two, he is the least adored by the farm animals, and seeks to get rid of Snowball. He instructs his slave dogs to reinforce his power. Similar to Stalin, Napoleon prefers to stay out of the public eye – building his reign of power through corruption and in secrecy. The windmill symbolizes the large infrastructure projects and modern construction that the leaders of the Soviet Union introduced immediately following the end of the Russian revolution. As used in Animal Farm, the windmill is also called upon to represent the triumph of the pigs in creating a totalitarian state. All of the other farm animals worked diligently to build the structure, believing that is would ultimately benefit each of the farm’s inhabitants; however, in the end, it only benefited the pigs. Yet, even still, the animals continued to believe that it was beneficial for them. Russia, and the rest of the world, witnessed two revolutions in 1917. The first being the overthrowing of the Russian Monarchy, the Tsar, and the last being the development of the Union of Soviet Social Republics – the first Communist state in the world. In the thirty years that followed, the Soviet government would enforce a totalitarian regime that would be used to condescend socialist ideals of equality and used to oppress its inhabitants. Who is Snowball in Animal Farm?